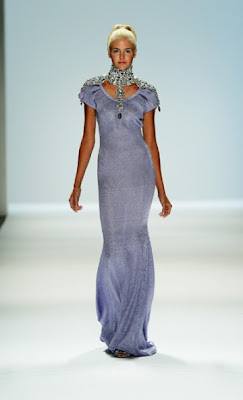 Jessica, our Midwest operative, reports on Zang Toi's spring collection for 2013. The show began with very elegant, classic pieces with a focus on black and white skirt and suit separates. One of the early stunners was a cream-colored dress with a high ruffle collar (above, right) followed by a procession of structured dresses in muted pastels. As the show transitioned from black and white to color, the dresses became increasingly formal. 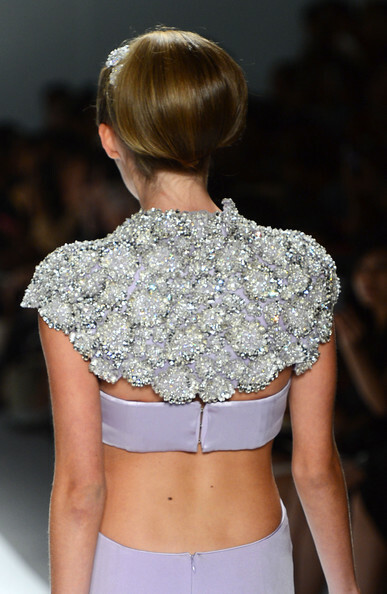 One of my favorites was a pale pink gown with a full skirt and flowered detailing at the back (above). Pastels reigned the evening looks with decadent jewels decorating the necklines, waistlines and shoulders. These intricately jeweled dresses really stole the show, some with low cut backs, cut-outs along the side, or a one-shoulder design. If Zang Toi has his way this spring, jewels are here to stay!